One lesson the recent debacle in Sioux Falls brought to center stage is that many leaders cannot discern friend from foe in the war against the Islamic Movement. This exposes Americans to greater danger each day. Abdurabman Alamoudi was the most prominent Islamic leader in the United States in the 1990’s, and founded or led major Islamic organizations, including the Muslim Students Association. He created the Muslim Chaplain program for the Department of Defense, was a “Goodwill Ambassador” for the State Department, and was the Islamic Advisor to President Clinton. The Washington Post called him the “pillar” of the Islamic community in Washington, D.C. 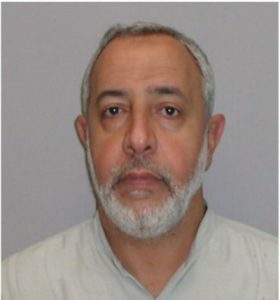 In 2003, Alamoudi was arrested at Heathrow Airport in London, England with $340,000 cash he received from the Libyan government for the global jihad. As the US government publicly stated, Alamoudi was a financier for Al Qaeda. He was sentenced to 23 years in prison – the sentence was reduced under President Obama’s administration by 6 years. He will be released in 3 years. None of the men or women working directly with Alamoudi have been prosecuted. Mohamed Magid holds a secret clearance and, until recently sat on the Homeland Security Advisory Committee. He worked directly with the last several Secretaries of State, receives awards from the FBI, lectures at CIA headquarters, worked with the Obama administration, and was publicly lauded by the President’s Deputy National Security Advisor – Denis McDonough. Until 2014, Magid was the President of the largest Islamic organization in North America, the Islamic Society of North America (ISNA) – which also happens to be, according to the Department of Justice, a Muslim Brotherhood organization which directly funds the terrorist group Hamas. 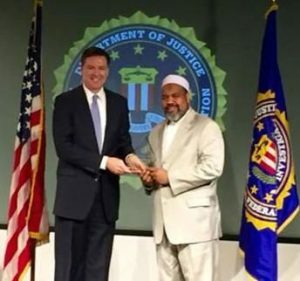 Magid was recently given another award by FBI Director James Comey. Anwar al Awlaki was called the “new face of moderate Islam” by some in the media, like NPR and PBS. He gave lectures inside the US Capitol about Islam’s prophet Mohammad and spoke at the Pentagon while he was the Imam of a Hamas mosque in Virginia – the Dar al Hijra Islamic Center. 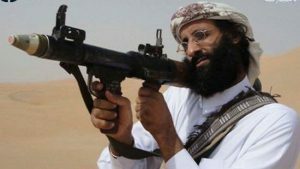 This “moderate” muslim was killed in September 2011 by a US drone strike because he was the leader of Al Qaeda in Yemen. Suhail Khan is the son of one of the most influential Muslim Brotherhood leaders in the United States. ISNA has an annual award named after his father. Khan himself publicly lauds his deceased father and proudly proclaims the jihadi mantra that muslims love death more than the unbelievers love life. 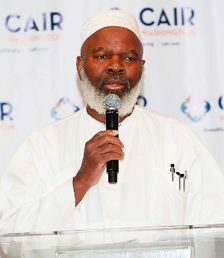 Siraj Wahhaj was the first Muslim Imam to offer prayers inside the US House of Representatives. 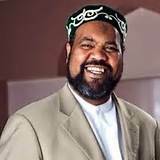 Wahhaj is an unindicted co-conspirator in the 1993 World Trade Center bombing and was a character witness for the Blind Sheikh, convicted for his part in a number of terrorist plots in the US. On any given day, Nihad Awad can be found walking the halls of Congress, on CNN or Fox News programs (like the O’Reilly Factor when it was on the air) or meeting with Christian or Jewish leaders around the nation as a part of “outreach.” Local and and national media fall over themselves to promote Awad’s organization, the Council on American Islamic Relations (CAIR), as a “civil rights organization” and they go to great lengths to defend them. The US Department of Justice identifies CAIR as a member of the US Muslim Brotherhood’s Palestine Committee, which is Hamas. 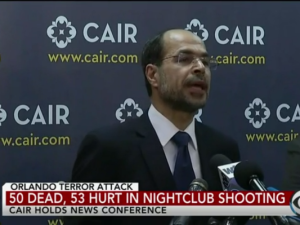 CAIR is Hamas. 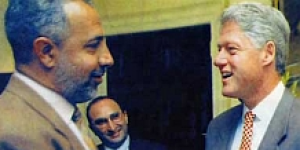 Nihad Awad is the leader Hamas in the United States and – in UTT’s professional opinion – is also the General Masul (Guide/Leader) of the US Muslim Brotherhood. American citizens, your leaders across the board – of both political parties – have proven they are incapable of discerning friend from foe. As UTT continues to restate: this war will be won at the local level or it will be lost. Local Sheriffs and pastors are the key. Get to work educating them. UTT stands ready to help. Keep up the good work John, everything you do is greatly appreciated! Furthermore, the ever burgeoning cabal of sociopaths bogusly posturing under color of law as mandated micromanagers delegated to effectively thwart the President of the United States from fulfilling his singularly explicit primary duty under the Constitution to protect the lives of the American people as he — AND HE ALONE — chooses to do, I.e., “sociopaths” who, incidentally, exist amid multiple concentric circles of high-tech security, should, in view of their obvious contempt and/or inexplicable ignorance of GOVERNMENT EXHIBIT 003-0085/3:O4-CR-240-G/U.S. v. HLF, et al, at least, be impeached.